Steam Support is unable to modify or remove any region restrictions. Do products I purchase on my Steam account have any region restrictions? 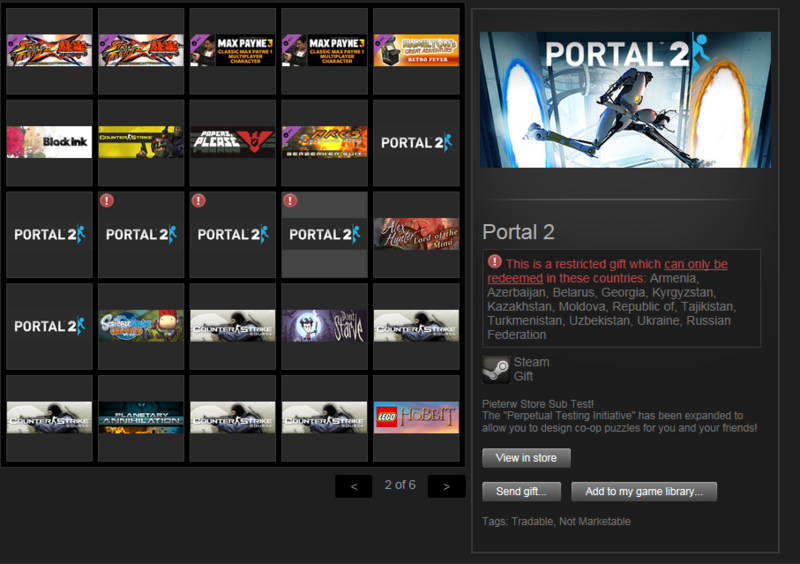 In most cases, there are no region restrictions on products purchased directly from the Steam store. However, products purchased as gifts may have region restrictions. Please see the gifts section for more information. How will I know if a product has region restrictions? Any region restriction on a product will be clearly noted on the product's Steam Store page as shown below. Most products purchased for yourself on Steam do not have region restrictions. What if I am traveling and the product I am trying to purchase has a note about region restrictions? If you are currently traveling, please ensure that your store region is correctly set to the country where you permanently reside as shown below. You may view and change your store region from your Account Details page. Learn how to change your store country. I purchased a CD key from another retailer. Is it restricted to a certain region? Region restrictions on CD Keys vary by each individual publisher. There is no standard or universal restriction placed on retail games. How do I know when a CD Key or retail product is region restricted? Region restrictions on CD Keys should be noted by the publisher on the retail packaging of the product. To be safe, ask the retailer if there are any region restrictions on this product before purchasing. If you have issues with the purchased product, please contact the retail store where it was purchased. I’m getting an error 'Game not available in your territory' when I’m trying to add a CD Key to my account. What should I do? You will see this error message if you have purchased a regionally restricted copy of a game and you try to register its CD Key in a different region. If you do not live in the designated region for that game you must contact the seller for a refund. Steam Support cannot offer refunds on CD Keys purchased from 3rd party retailers. 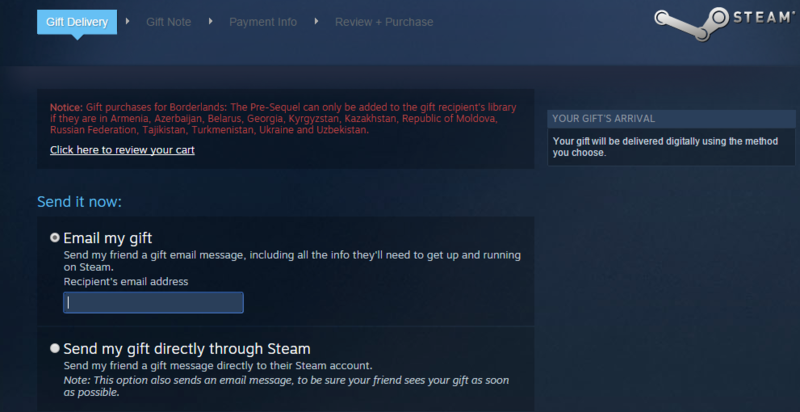 Are Steam gifts region restricted? How do I know if a certain country is included in a specific region on Steam? The exact countries where a gift can be redeemed in are shown during purchase. Please see the above image as an example. The countries that are included in a specific region are subject to change. 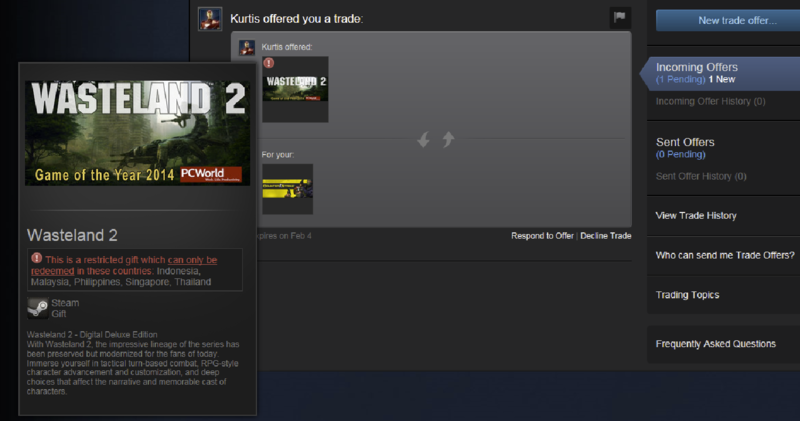 I received a Steam gift. How will I know if it has a region restriction? Each gift will clearly note in the gift's description which countries it can be redeemed in. You can view the description from your Steam gift inventory. Steam Support cannot modify region restricted gifts. You should contact the friend who gave you the gift to return it or have them ask for a refund. How will a region restricted gift appear to me in my inventory? Can I find out before I trade for a game whether it is region restricted? 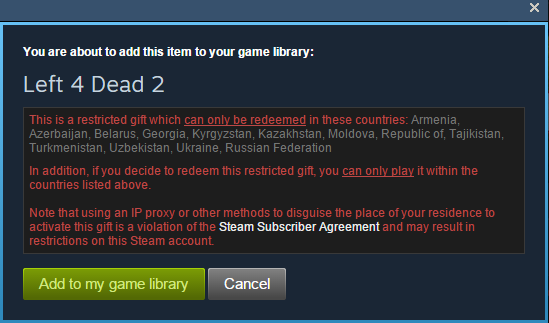 Can I use a proxy, VPN or disguise my location to redeem a region restricted Steam Gift? What happens if I have redeemed a region restricted gift and cannot play it? You will need to purchase this product from your current location without using a VPN/proxy or obtain a copy that is sold within your country of residence. If you are unable to complete a purchase on the Steam store, please contact Steam Support.